All the Brighton SEO 2015 slide decks in one place. Brighton SEO is without a doubt the UK’s largest and best SEO conference. We have pulled together all the slides we could find and listed them below. If we are missing a deck feel free to ping us a tweet @SearchCandy or get in touch. New! 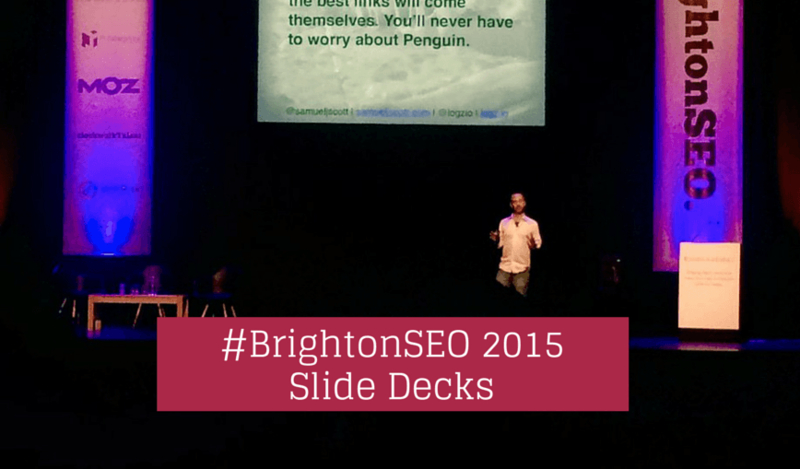 You can find the September 2015 BrightonSEO slide decks here. Update: Have added a bunch of extra decks that came through, and an index so you can jump straight to a specific deck. Samuel Scott – Stop Thinking About Links – Think About Publicity! We hope you have found this post useful. Leave a comment below if you have any suggestions/URLs to include. Main image: Do real Marketing & PR and the best links will come themselves – Photo by Anna Youngs @ Twitter, used with permission – thanks!